Poodleism: ...This coffeee is a lot warmer than I thought. Nothing effs with your day quite like a car wreck. 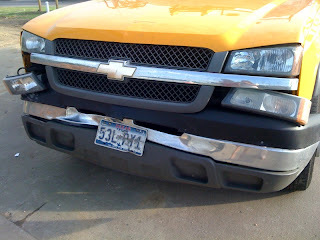 This morning on the way to Arlington, I was the passenger today, me and my compatriot got in a little fender bender. (Side note: Only 2 members of the carpool were present, we’ve had to go to a 2-car system as our workload has required some later hours. Boo.). By fender bender, I mean we were rear-ended going about 65 mph on I-35. The specifics of this collision are somewhat complicated to get into now, but my driver was not to blame. Getting hit that hard is one of the scarier things I’ve been through. We were both freaking out. Neither of us was hurt, both noggins slammed against the side windows, but nothing too bad. That’s the true blessing of the situation. Everything you’ve read about Volvos being safe is true. We were in a Volvo S40 at the time of this incident. It was still scary, but it genuinely felt like the big truck just bounced right off of us. The Volvo sustained some cosmetic damage, but the front of the truck got way crumpled. See below. I’m takin’ my Volvo message to the streets. Buy a Volvo. You’ll feel highbrow and you’ll live through a car accident to enjoy it. Thank goodness my manfriend just acquired one. Note: These are the ACTUAL photos taken at the scene of the crash. Totally Ridic. I'll take this moment to go on a selfish diatribe. Whilst my friend’s car was getting slammed, I got totally doused in piping hot coffee. I cannot explain how covered in the stuff I was. Pants, hair, shirt, face, in the ears….everything was covered in hazlenutty deliciousness. There is some mild scalding on my chest and one side of my face. I guess that’s the most serious injury. I remember that old McDonald’s coffee lawsuit where a lady burned her mouth and got millions of dollars. TRY TAKING A BATH IN THE STUFF LADY! The silver lining is that it brought my friend who got in a car wreck immeasurable laughter. I stepped out of the car and the two men in the guilty truck even laughed. Awesome. We had to go back to my apartment to change, thereby being even later to work. Awesome-er. Even six hours later I’m still covered in a sticky hazlenutty film. Awesome-est. Glad nobody was hurt, but one stiff back and nutty film later, I’m still annoyed. Ready for a new day.